This tree in my yard is next to the bright yellow one that I posted a couple of days ago. I set up on my patio to grab the morning backlighting. 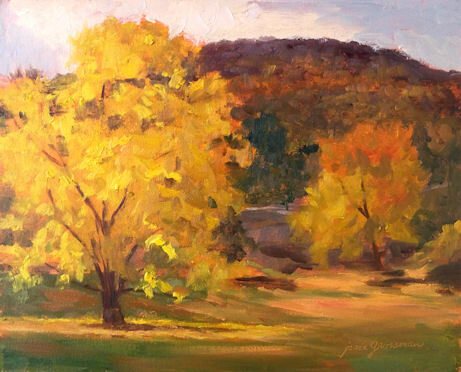 The dark background and light filtering through the tree made for a bright, fall spectacle. It’s a fall version of a Christmas tree! The trees here have been unbelievable this week! This bright yellow maple laid down a carpet of golden leaves, and the purple mountain behind it made it all the more striking. The weather has been warm and beautiful. I wish fall would hang on for a couple more months. 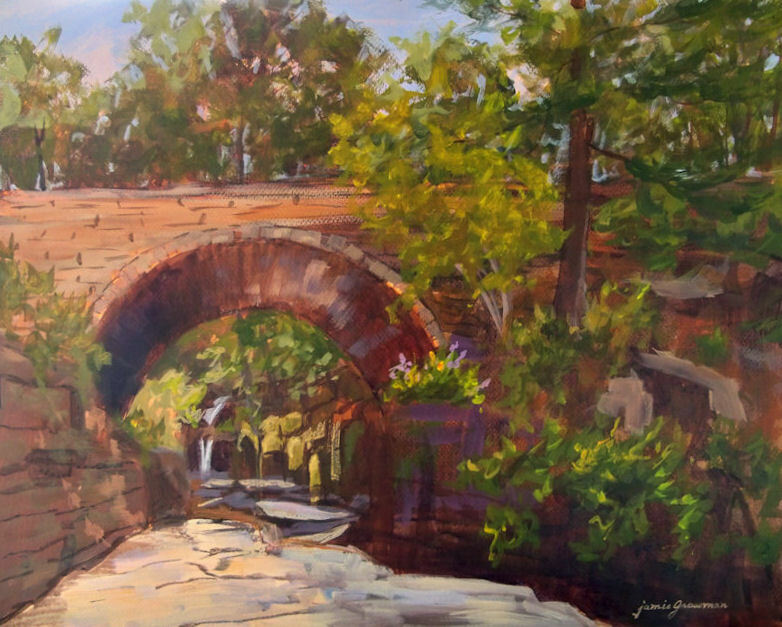 This is another painting from one of my favorite locations in the Catskills. The chasm to the right, “Hell’s Hole”, goes down over 100 feet. My friend Tarryl was standing to my right as I painted this, and I wanted to tether her to a boulder to be sure she wouldn’t take a tumble! I loved the way the strong light illuminated the foreground rock ledge, and drew the eye through the tunnel to the waterfall beyond. I feel like I could paint this scene a hundred times and not get tired of it. 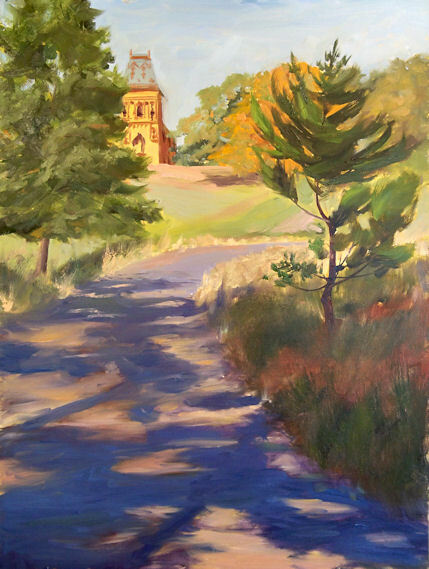 This was painted last week, the day after the larger Boscobel painting posted previously. I was actually planning to do a large painting at Cold Spring, but when I arrived there, it was so freezing cold on that open area of the river, that I went back to Boscobel instead. Even up on the bluff overlooking Constitution Marsh and the Hudson River, it was warmer than the other location. 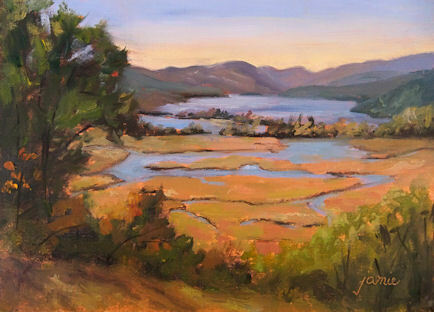 The marsh was even more beautiful than the day before, and due to the chilly weather, I painted small and went home earlier. I’m not ready for winter! I wanted to paint this scene backlit, but by the time I got myself out there this morning, it was a bit sidelit, and not as heavily silhouetted as my vision. Still, it wasn’t hard to motivate myself to make the most of the beautiful scene looking out through the treeline to the meadow and beyond. Pathways are always so inviting, and the fall foliage in the Hudson River Valley is nearly at peak. I’m continuing on my journey to thicker paint application, which results in brushwork changes as well. I’m liking the three dimensional paint surface and mixing up huge piles of color! 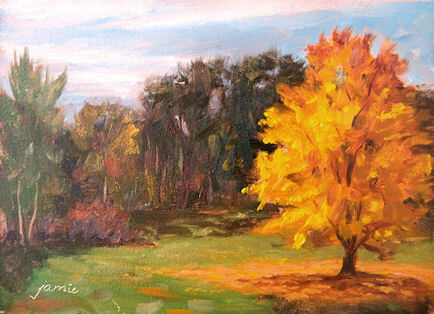 What a gorgeous fall day it turned out to be today, following a few days of dismal, rainy weather. 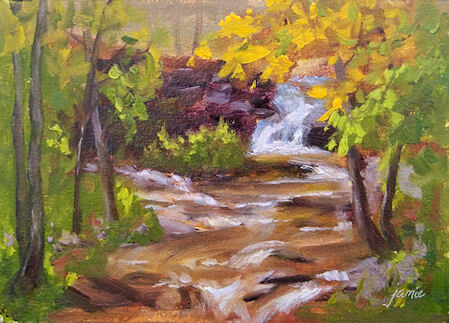 Our waterfalls are gushing and the foliage is nearly at peak. My dog sat beside me, impatient as usual when I’m painting instead of paying attention to him. I’m trying to constantly remind myself to put down more paint, more paint, more paint. 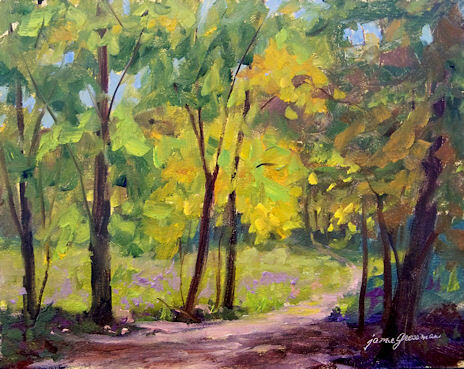 I’m reminded of quotes I’ve heard here and there, such as, “Put out twice as much paint as you think you need and use it all!” A quote I’ve heard attributed to Robert Gamblin (of Gamblin Oil Paints) is, “Paint like you own a paint company!” I’m eager to add more of that third dimension to my work in oils. My paintings will be taking a little longer to dry, but it will be worth it! Today was the annual Artists on Location paintout for Garrison Art Center. 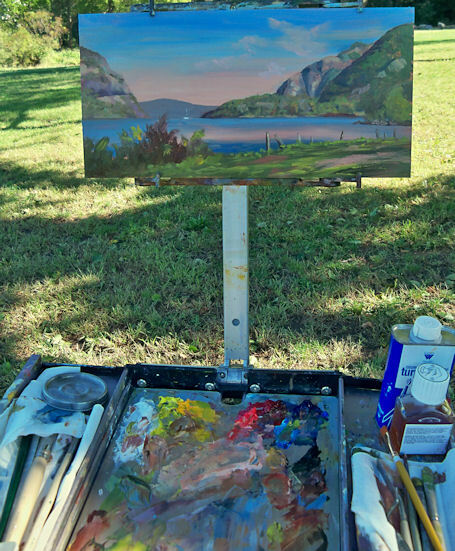 I drove down from upstate at 5:50am with two artist friends and we decided to spend the morning painting in the beautiful waterfront park in Cold Spring on Hudson. There was a pinky glow on the horizon suring the sunrise, and when I was about half way finished with the painting, some beautiful, wispy pink clouds moved into the scene just at the right time to pop them in. This photo was taken about a half hour before finishing it, so it’s pretty close to done here. We had to deliver the completed paintings to the Art Center by 2pm, and they were all auctioned off in a live auction at 5pm.